We sell the essentials for your daily life in Japan. 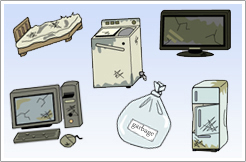 In Japan, due to recycling laws, it’s difficult to sell used home electronic appliances even if they are in usable condition. Because of smaller sizes of the houses in Japan, removing big furniture like beds and sofas are subjected to a fee-based service. We come and collect goods you cannot take when you move or go back home, for a reasonable fee or buy them. 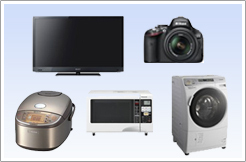 Generally, home electronic appliances that are easy to sell are not more than three years old (depending on the condition). For furniture, smaller, more compact items are easier to sell. However, designer furniture is an exception. Please confer with us if you have any inquiries. In Japan due to the system and laws of recycling, you have to pay a lot for disposal. So, we highly recommend considering recycling before disposal. Our delivery fee depends on how many items you bought and the total cost, where you live, and if you need an assistant to move the product. 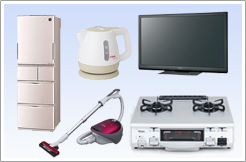 Our collection service might not be available, depending on the kinds of items, total amount of items and schedule. 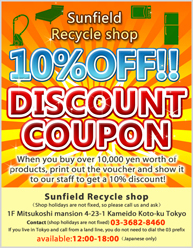 When you buy over 10,000 yen worth of products, print out the voucher and show it to our staff to get a 10% discount! ※To print from PC（DISCOUNT COUPON）←Simply print this page and you can use it as a discount coupon! Alternatively cell-phone users can simply show this page on their screen to get a discount!